If you’re looking to take yourself, your partner and your family away on an unforgettable getaway but you aren’t sure where to, what about just into your own states backyard in the form of glamping. Now all the rage, glamping – literally a form of camping, but with more luxury and style – is becoming the go to holiday choice for couples and families alike and provides all the comforts of home with the outdoor lusciousness of everyday camping. Read ahead for a couple of top glamping options in the USA and get ready to reconnect to nature in luxury! Sleeping up to thirty people, send out your birthday invitations and visit this glamping destination in Harbour County with beaches, shopping, wineries and great dining options. Touted as an ideal place for weddings, family reunions, large birthday celebrations and the like, this particular spot is located only a few miles from Warren Dunes State Park. Glamping options include deliciously decorated cabins, and they offer the fourth night free. On top of a ridge overlooking the creek in Texas Hill Country, these luxury tents will spell out romance and elegance from the moment you set foot on this lush resort. Developed to perfectly combine luxury and eco-friendly practice, the Sinya On Lone Man Creek resort is perfect for those looking for a romantic getaway without having to go too far. Situated only 45 minutes away from Austin, this makes a perfect weekend getaway for couples looking for some serious romance. Escape into nature at this beautifully appointed retreat, seven tipi rooms accommodating your guests in style and a simple old world elegance with comfortable interiors and a quiet ambience. Nature is king at the Tipi Village Retreat, with quiet times starting from 10pm and gourmet breakfasts included in the room price. Perfect for weddings, family reunions, corporate events and more, this is the ideal place to really kick back and get back to nature. This fantastic ranch in Colorado set amid hills and against a backdrop of mountains is the perfect location for families and couples who are active and like to get out and doing things like horseback riding, cycling, riding ATVs and the like. Perfect for small and large groups as well as weddings, the 14ers Ranch couldn’t be more welcoming. Glamping options include luxury tents as well as beautifully appointed villas that perfectly fit everyone. 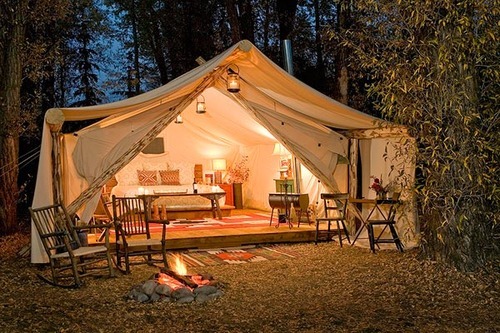 So there you have a couple of great options for glamping in the United States. With it becoming such a fantastic option for getting out and away these days, you can easily find more great options for glamping and camping anywhere in the United States. You will surely find the perfect location for you and your family for your holidays this summer!